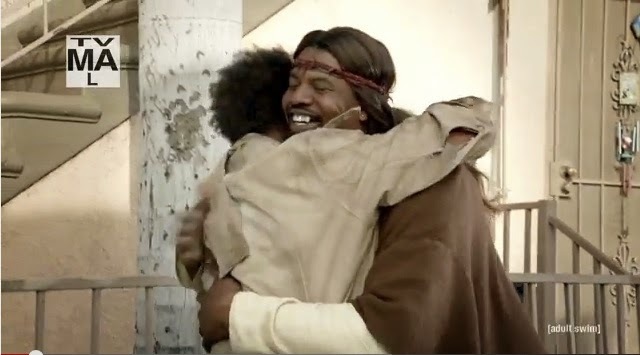 Black Jesus is an American comedy series created by Aaron McGruder and Mike Clattenburg, that airs on Adult Swim. The series stars Gerald "Slink" Johnson, Charlie Murphy, Corey Holcomb, Kali Hawk, King Bach, and Andra Fuller. The series premiered on August 7, 2014... 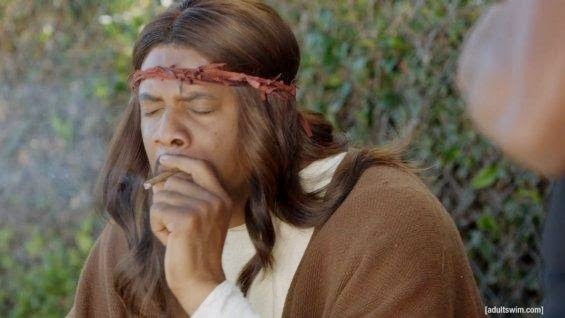 The live action, scripted comedy features the black Jesus Christ living in modern day Compton, on a mission to spread love and kindness throughout the neighborhood with his small group of followers. AYTD has just watched this premiere episode and thought it was fairly funny. Perhaps the bad language was a tad excessive, but I assume it's trying to be authentic to the perceived nature of overall life and culture within the black community of Compton. "The Messiah ['Iesa (Jesus)], son of Maryam (Mary), was no more than a Messenger; many were the Messengers that passed away before him. His mother [Maryam (Mary)] was a Siddiqah [i.e. she believed in the words of Allah and His Books (see Verse 66:12)]. They both used to eat food (as any other human being, while Allah does not eat). Look how We make the Ayat (proofs, evidences, verses, lessons, signs, revelations, etc.) clear to them, yet look how they are deluded away (from the truth)." "And they say: "The Most Beneficent (Allah) has begotten a son (or offspring or children) [as the Jews say: 'Uzair (Ezra) is the son of Allah, and the Christians say that He has begotten a son ['Iesa (Christ)], and the pagan Arabs say that He has begotten daughters (angels, etc.)]."" "He to Whom belongs the dominion of the heavens and the earth, and Who has begotten no son (children or offspring) and for Whom there is no partner in the dominion. He has created everything, and has measured it exactly according to its due measurements. Yet they have taken besides Him other aliha (gods) that created nothing but are themselves created, and possess neither hurt nor benefit for themselves, and possess no power (of causing) death, nor (of giving) life, nor of raising the dead." "Say (O Muhammad (pbuh)): "He is Allah, (the) One. "And there is none co-equal or comparable unto Him." "
I don't think Jesus swearing and smoking within the show discredits or taints his inherent core status of his purpose in life. The underlying message of him showing his friends and to his community The Way of doing good as much as possible was present in the programme, and that surely is a more important thing to remember and take from it than his relinquishing to his vices, his skin colour, or that he had a weave rather than a natural afro-like do. So, what did you think of Black Jesus? Please leave a comment below. WARNING: The programme contains highly explicit language; viewer discretion is advise. The episode can be watched by following this link.